More often than not, on Tuesday and Thursday mornings, a line of women wraps around the building of the women’s health clinic at the Sihanouk Hospital Center for HOPE seeking free cervical cancer screening. On a recent Tuesday, a 36-year-old from Kampong Speu, who asked to remain anonymous, was one of them. She had been enduring abdominal pain for the past three months, with severe pain up to three times a week. “I want to find out what the problem is,” the woman said. Cervical cancer is not only the most common kind of cancer among Cambodian women, it’s the most prevalent cancer in the Kingdom. Cambodia’s cervical cancer rate is also among the highest, if not the highest, among Southeast Asian countries, doctors say. However, research on the topic remains sparse, and the availability of prevention services, screenings and adequate treatment remains severely limited, creating a high burden on the country, causing hundreds of preventable deaths every year and making younger-than-usual women more susceptible to the deadly disease, medical experts say. Data from February show that the country’s cervical cancer rate stands at 20.5 for every 100,000 women, according to the HPV Information Centre in Spain, which compiles, processes and disseminates country-specific information on HPV and cervical cancer. Rates in neighbouring Vietnam, meanwhile, are just over half that, at 11.3 for every 100,000 women, while Laos’s rate is just 9.8 for every 100,000, data show. The Kingdom has a population of about 5.56 million women, aged 15 and older, who are at risk of developing cervical cancer, according to the data, and the country sees about 1,512 new cervical cancer cases and about 795 deaths every year. Cervical cancer, however, is preventable, doctors say, and with more preventive resources – such as those provided by the women’s health clinic – the country could one day reverse those dismal statistics. Screening makes an important difference by detecting cancer at an early stage, when it can still be cured, said Dr Thay Sovannara. Sovannara’s research, recently presented in Australia, found that out of 1,000 women, there was an estimated 11 per cent prevalence of cervical abnormalities that can be indicative of cancer, most of which were in the early stages. What’s more, in Cambodia, detecting cervical cancer at an early stage is not always a victory in itself. Even with a diagnosis, many women lack the financial means to pursue treatment options, Sovannara said. “They decide to take the traditional medicine,” she said.Most women with diagnoses, she added, “are from the provinces”. Currently, however, both primary national hospitals in the country offering oncology treatment – Calmette Hospital and Khmer-Soviet Friendship Hospital – are located in Phnom Penh. Dr Eav Sokha, head of the Onco-Hematology department at Calmette Hospital, said there are several factors contributing to the high rate of cervical cancer in the Kingdom. For starters, there’s no HPV vaccine in the national immunisation program; pap smear screening, which has drastically curbed cervical cancer in developed countries, is not well established in Cambodia; and cultural norms often prevent women from speaking up or seeking treatment if they don’t have any symptoms, Sokha explained. According to Sokha, Cambodian women are also often unfamiliar with preventative measures, such as not smoking, using protection when sexually active, limiting the number of sexual partners and practising proper hygiene. For example, he added, he once met women in Kampong Chhnang who, during menstruation, used dirty pieces of fabric as a substitute for sanitary pads. “The young girls are now being educated, but there’s still the traditional ways,” Sokha said. One notable difference in Cambodia is that women suffering from cervical cancer are younger compared to patients in other countries, said professor Kouy Samnang, chief of oncology services at the Khmer-Soviet Friendship Hospital. While the culprit behind the phenomenon remains unknown, Samnang suggested early marriage could be a factor. While there are several screening methods for cervical cancer, medical professionals have come to learn that a visual inspection with acetic acid, known as VIA, is both affordable and effective, said Dr Khin Sam Ath, with WHO Cambodia. There are currently pilot projects for screening and treating cervical cancer in the provinces, Sam Ath said, but treatment remains concentrated at the district hospital level. Under the pilot programs, women get a VIA screening at local health centres, but must be referred to a district hospital for cryotherapy treatment, Ath said. While cryotherapy, which destroys abnormal tissue by freezing it, is performed in some countries by nurses, Cambodian nurses and midwifes at the health-centre level are not trained in the use of the equipment. According to Sam Ath, local treatment would be ideal, as those referred to district hospitals might not follow up. WHO Cambodia is supporting the development of the national action plan for prevention and control of cervical cancer, which would include primary prevention – such as the HPV vaccination for girls 9 to 13 years old – and secondary prevention – such as the VIA. Officials hope to have a draft completed this year. HPV vaccination can help prevent 70 per cent of cervical cancer cases, Ath said, while VIA screenings can theoretically catch the other 30 per cent. “If the country starts providing primary prevention and secondary prevention today, we will see the results in the next 20 years, almost 100 per cent of women can be prevented from [having] cervical cancer,” Sam Ath said. Rob Kelly, spokesman for pro-vaccine non-profit GAVI, said the organisation will provide just over $500,000 to support Cambodia’s two-year HPV pilot program. During that period, the country will receive more than 60,000 doses of HPV vaccine for use in two selected provinces – Kampong Thom and Svay Rieng. Dr Chhun Loun of the Ministry of Health confirmed that the ministry would be cooperating with GAVI to roll out the program. Other ministry officials did not return numerous calls seeking comment for this story. The availability of treatment options for those already diagnosed with cervical cancer remains limited, though may soon start to change. Sokha, Calmette’s head of onco-hematology, said by next year, Cambodia’s first national cancer centre will be operational. It will offer sophisticated treatment and medical procedures, such as nuclear medicine and bone marrow transplants. The International Atomic Energy Agency, Sokha said, will help with fellowships, scholarships and training in hopes of developing the cancer centre into a teaching facility. Cambodia needs “[to] produce our own oncologists,” he said. Two more regional cancer centres are planned to be built by 2025, Sokha said, with the centre in Phnom Penh to cover about 60 per cent of the population, another in Siem Reap to cover 30 per cent, and a third in Kratie to cover 10 per cent. “The aim is to create a triangle for a national cancer centre network,” he said, adding, however, that he wasn’t sure if the plan could be completed by 2025. 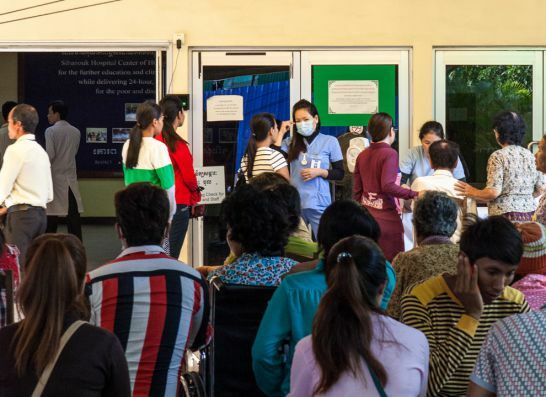 Khmer-Soviet Friendship Hospital alone gets about 350 cervical cancer cases a year, said Samnang, the oncology chief, and 60 per cent of those are already at an advanced stage. On Wednesday afternoon, Phoung Sokhom, 38, from Kandal, was waiting in Khmer-Soviet’s radiation department. Sokhom was diagnosed with stage-2 cervical cancer in February of 2015, and was scheduled yesterday to go in for her 28th day of radiation and chemotherapy, the last of her treatment. Seated in the waiting room, Sokhom closed her eyes and slowly reopened them. “I don’t have much hope,” she said. Sokhom, who had already paid more than $1,000 for her 28 days of radiation, said that her condition may require surgery or more treatment, but she doesn’t have the money to pay for it. “I’m not sure yet,” she said of what might happen next.